A set of design goals and a protocol specification for a multiplexing terminal emulator server with many features. A server implementation written in cross-platform, multithreaded C++ with minimal dependencies. A terminal emulation system with a focus on connectivity, productivity, and collaboration. Free software, licensed under GPLv2. How to get started • Already using TermySequence? Visit the users' page for news and updates. Connection chaining: Establish connections from client to server and from server to server using common login commands. Connect directly through a terminal or in the background. Ideal for use with containers. Minimal size and dependency footprint. Establish connections using standard container login commands. Works with any container runtime. Filesystem access available to connected clients. Download, upload, mount, pipe, and more across any number of hops over the same connection used for terminals. Clients automatically receive directory listings for all terminals' current directories. Per-file git status information included in directory listings through the use of dynamically loaded libgit2. Relative modification times included with each non-empty line of terminal output. Use the timing widget to view them in the client. Terminal emulators run in separate threads from connections, with scrollback contents downloaded asynchronously. Command output within terminals is not limited by connection speed. Support for multiple simultaneous inbound connections. View and interact with other users' terminals within the context of a shared account. Upload an avatar image which will be displayed to other users on your terminals. Share font and color settings. Attach arbitrary UTF-8 key/value pairs to terminals, servers, and text regions. Create custom monitor scripts to report arbitrary server status information to clients. Display inline images using iTerm2-compatible imgcat and imgls utilities. Create custom port forwarding on demand across any number of hops over the same connection used for terminals. Optional socket activation support and unit files allow use as a systemd user service. Use the keymap tool to quickly get started with the application. It's a built-in cheat sheet for your key bindings. Autocomplete entire commands using the suggestions tool. 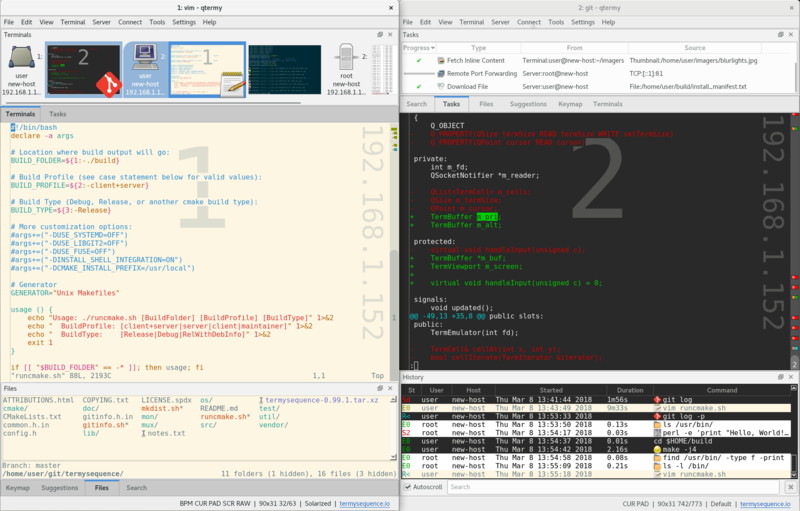 Two separate input modes: command mode, for implementing vim-style dual mode keymaps, and selection mode, for mouseless manipulation of text selections. Supplement the terminal viewport with useful widgets to display marks, minimap, and timing information. Use batch connections to establish multiple outbound connections at once, including sequential connections across multiple hops. Create annotations at points of interest within the terminal. Annotations are stored on the server and are visible to other users. Display an icon image with each terminal's thumbnail depending on which command is running in the terminal. Switch icons automatically using a custom ruleset. Comprehensive settings system including terminal profiles and per-server settings. Switch terminal profiles automatically using a custom ruleset. Giving a demo? Enter presentation mode to hide distractions, increase the terminal font size, and go fullscreen in a single keystroke. Define launchers to run applications and open files and URL's. Capture remote program output and mount remote files to be opened in local applications. Bind commands to keystrokes. Define alerts to perform a variety of actions when a condition becomes true in a terminal. Custom-rendered emoji images and box and line drawing characters.